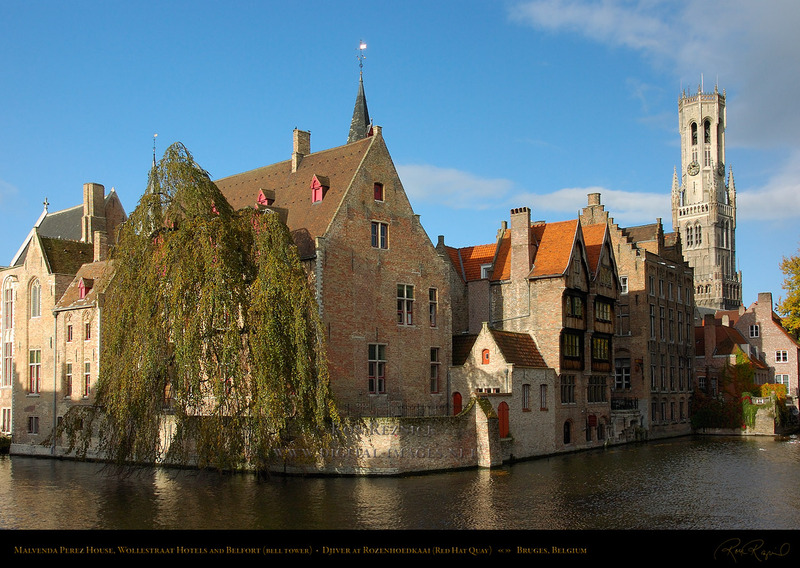 and post-Renaissance architecture are displayed on the Canals and Street Scenes page. surrounding a traditional garden. 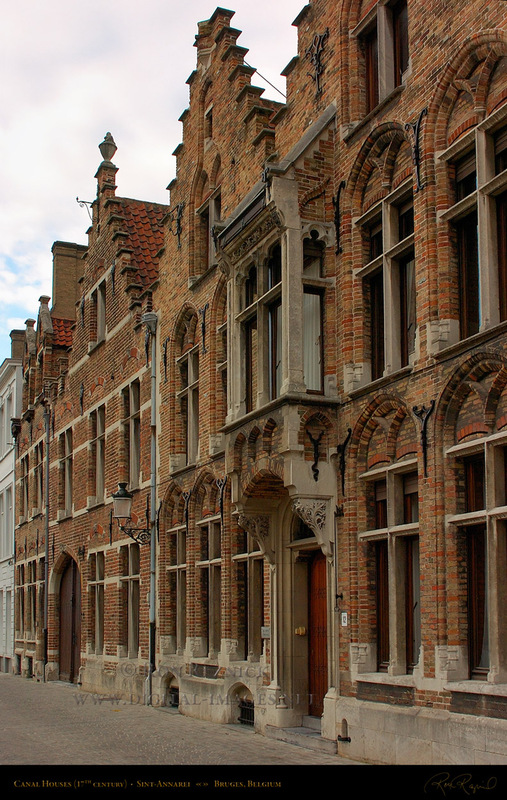 It is a superb example of Flemish medieval-style architecture. Genthof just beyond Jan van Eyckplein in central Bruges. 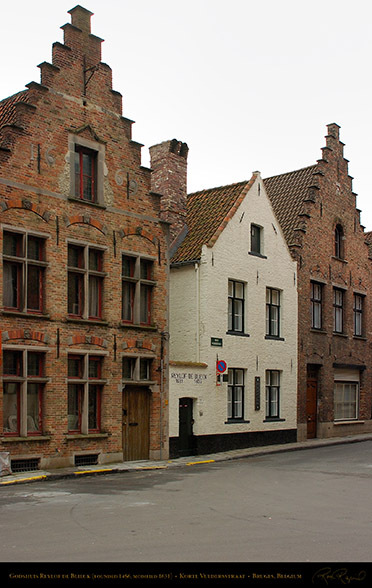 The house on the left with the stepped gable was built in 1715, and Houten Huis (15th c.) next door is one of the two houses in Bruges with an intact original medieval wooden facade. 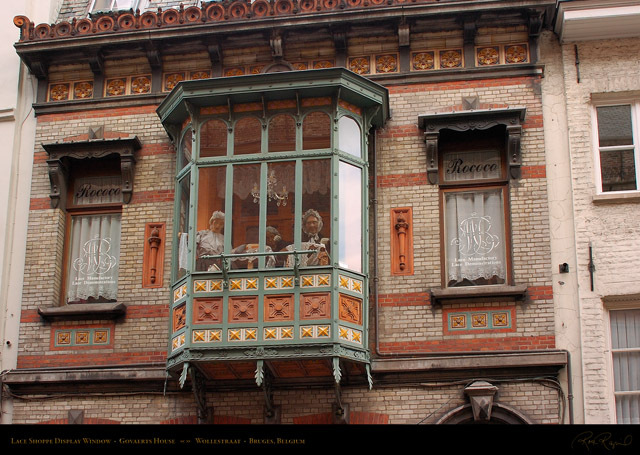 This ornate Baroque house stands in the square at the end of Stoofstraat at Walplein. 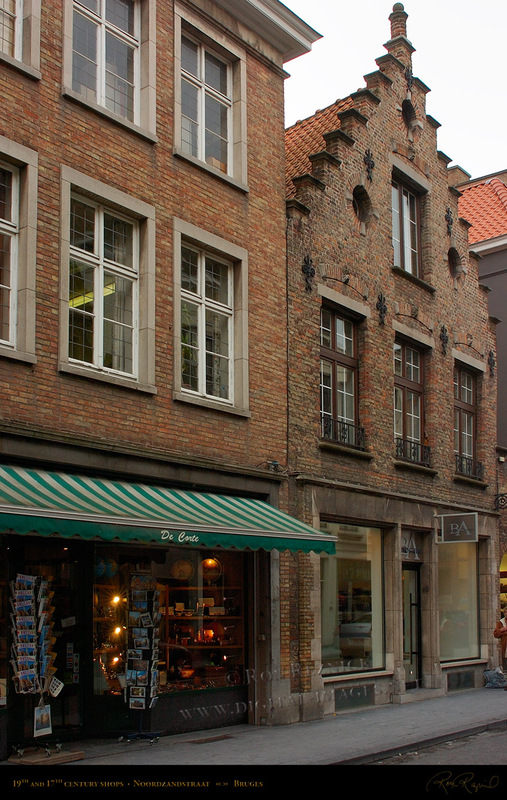 Stoofstraat (Stove Street) is one of the narrowest of the streets in Bruges. 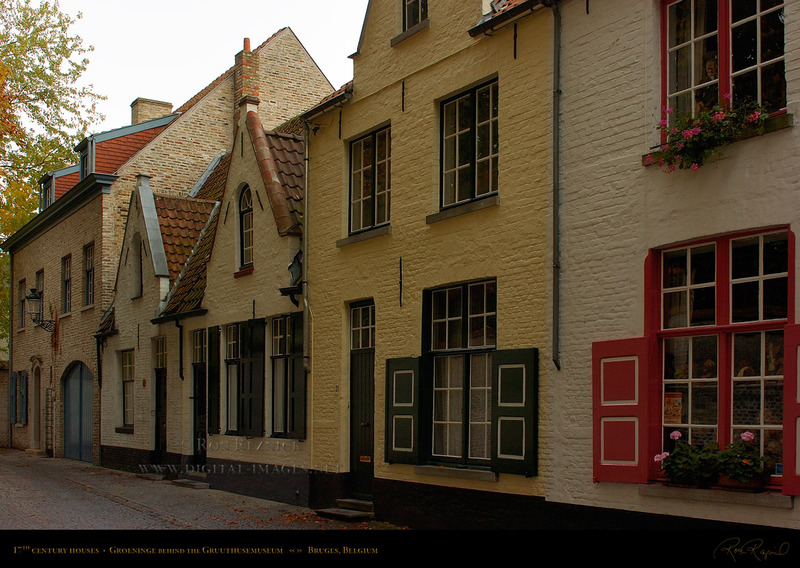 In one section you can touch both sides (see the Canals and Street Scenes page). On the Walplein (originally Waals Plein, Walloon Square, the medieval square where French-speaking Belgians (Walloons) and French traders met), a brewery has existed since 1564. 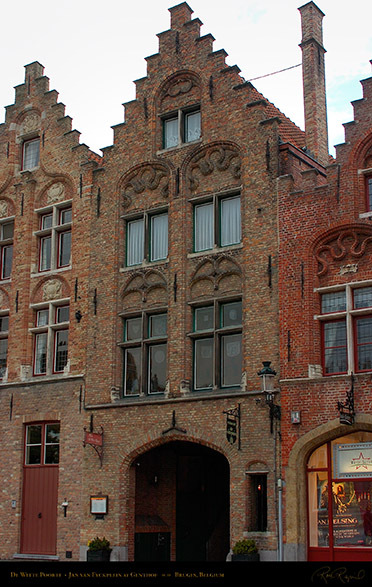 In 1856, Henri Maes rebuilt Die Maene into a modern brewery. 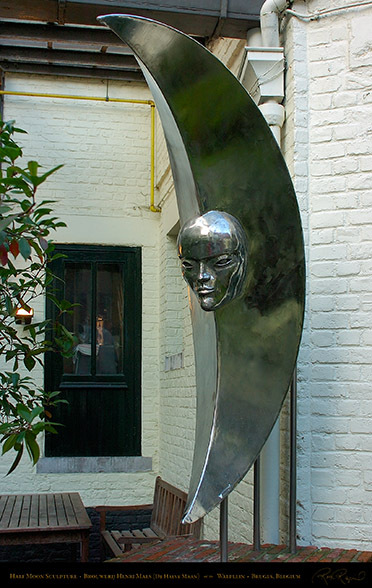 The Half Moon sculpture in the Brewery courtyard. Bouwerij de Halve Maan is not only a functioning brewery, making excellent (strong) beer, it is also a Brewery Museum. 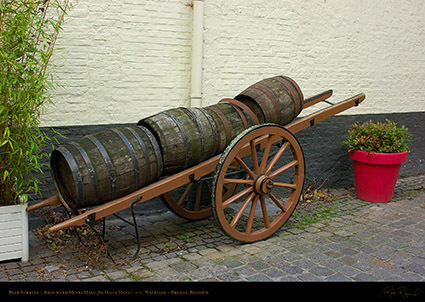 Beer Barrels in the Browerij de Halve Maan courtyard. which is still actively operating in the city center of Bruges. Kathe Wohlfahrt Christmas Store on the Walplein. 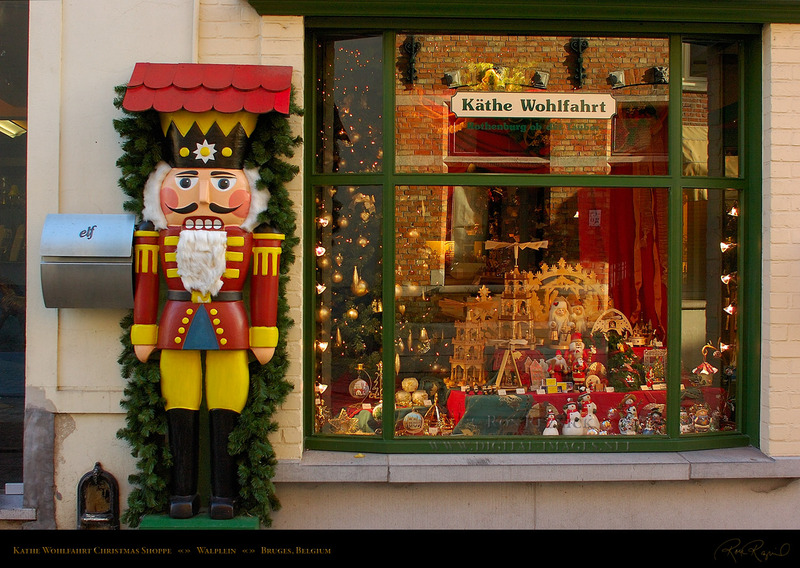 Traditional German Music Boxes and Christmas ornaments. 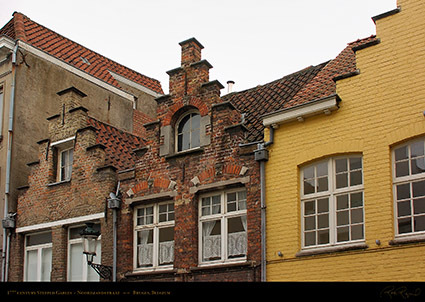 Traditional houses on Goezeputstraat (c. 1500) with medieval straight gables and plain facades. 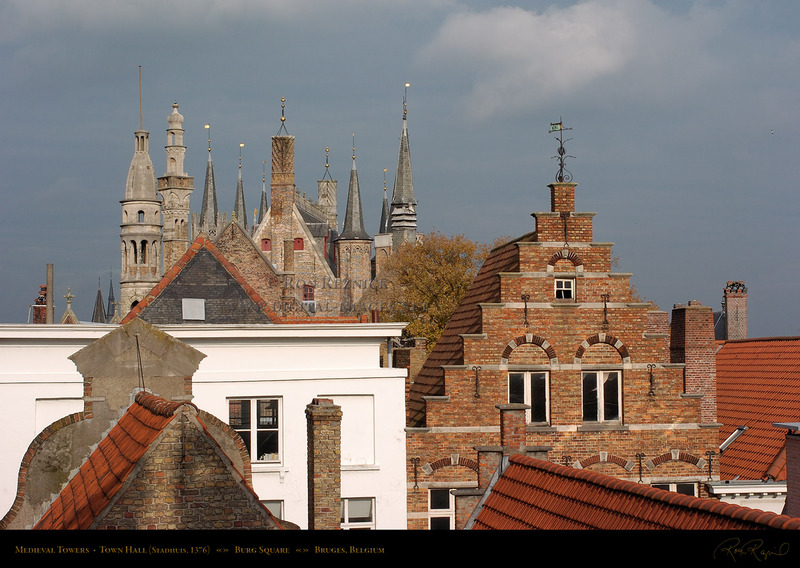 The stepped gables which are commonly seen in the architecture of Bruges arrived from Northern Europe in the late 1500s. Godshuis Reylof de Blieck, founded in 1456 as a widow’s house and modified in 1631 by the addition of a house for the poor. On either side are 17th century houses with stepped gables, typical of the architectural style of Bruges. 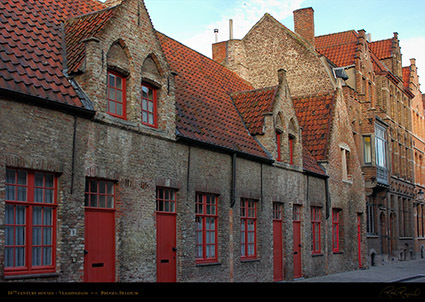 16th century diephuizen (deep houses) on Vlamingdam. 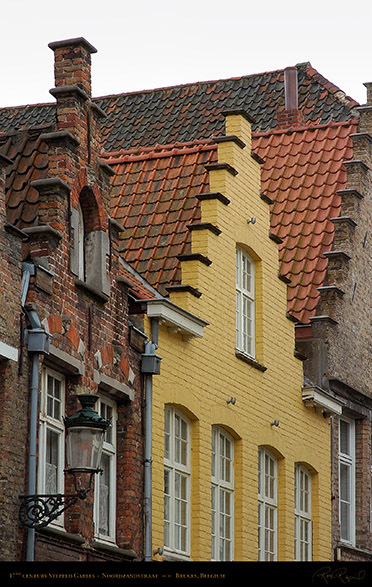 17th century stepped gables on Noordzandstraat. are often capped with slate or other stone as these are. De Witte Poort (The White Port) on Jan van Eyckplein. 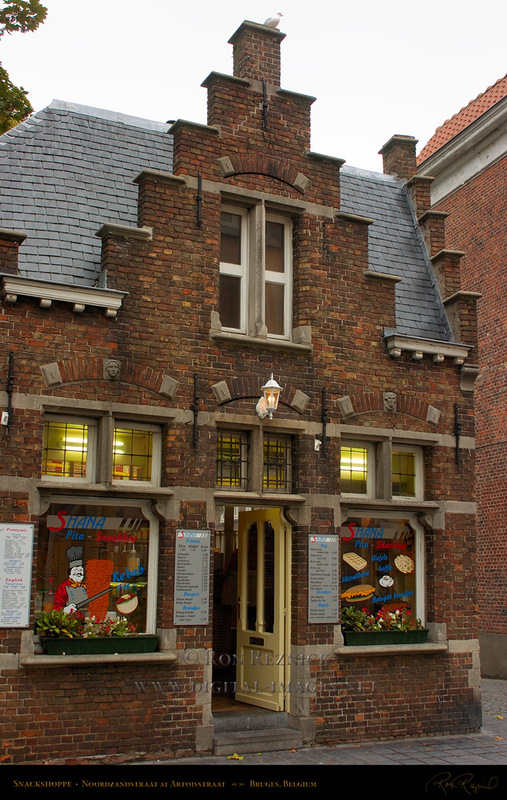 in the 19th century, De Witte Poorte is now a restaurant. 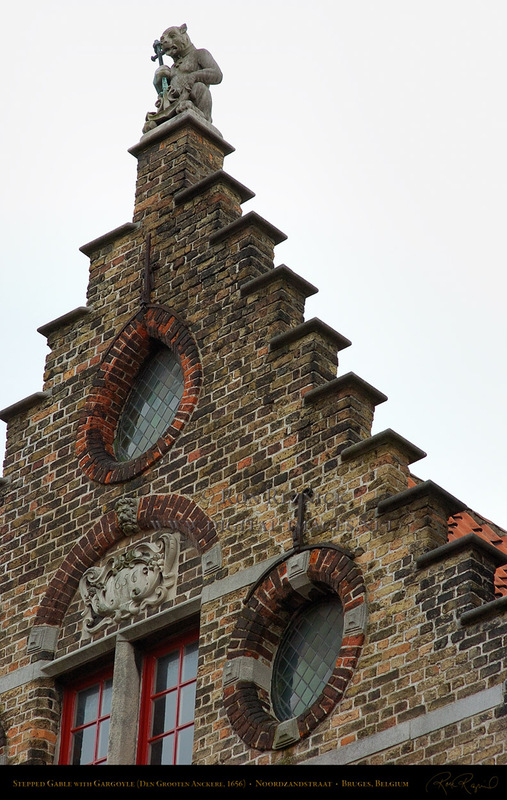 Detail of the 17th century stepped gable and facade of Noordzandstraat 71. 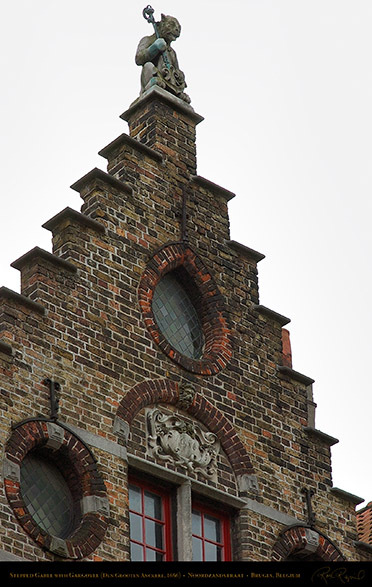 Stepped gable of Den Grooten Anckere (1656), topped by a stone bear gargoyle which is holding ”the Great Anchor”. 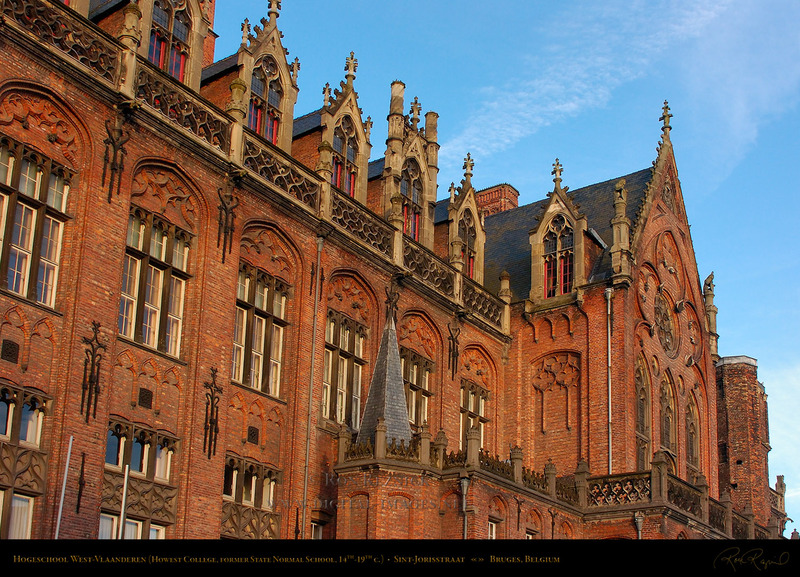 The Baroque facade is pierced by circular and teardrop-shaped windows with diamond-cut traditional crown glass. 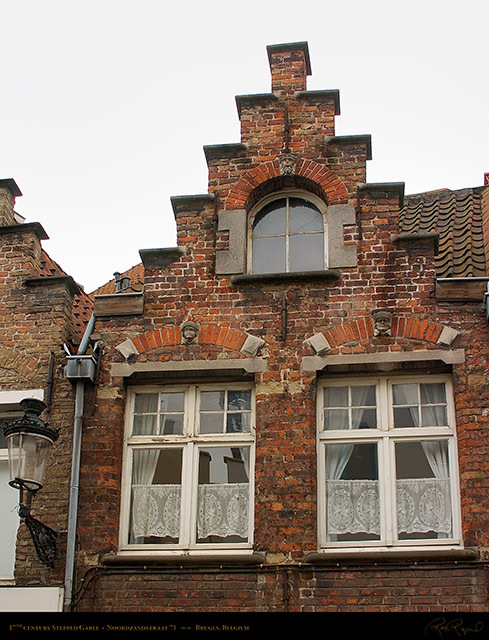 The diamond-cut glass is typical of higher-quality medieval and later-period blown-glass windows. Glassblowers would spin a bowl, then cut diamonds from the thin outer sections. 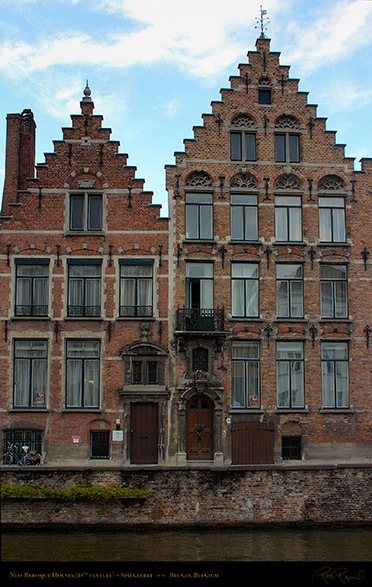 The inner “bullseyes” were assembled into lesser windows. 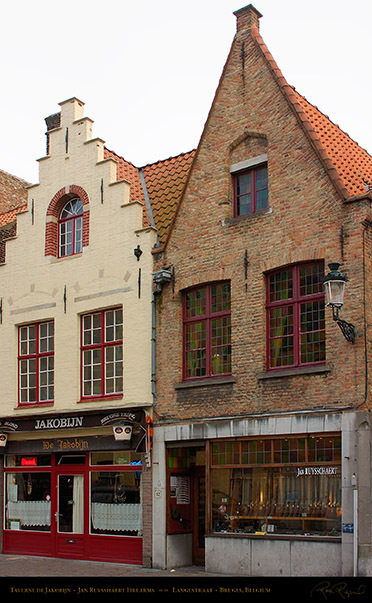 19th and 17th century shops on Noordzandstraat. A snackshop with stepped gables on Noordzandstraat. (possibly cylinder-blown sheet) in the ground floor windows. 17th c. stepped gable canal houses on Sint-Annarei. A more frontal angle from across the canal is below. 17th century canal houses on Sint-Annarei, shot from across the canal on Verversdijk. 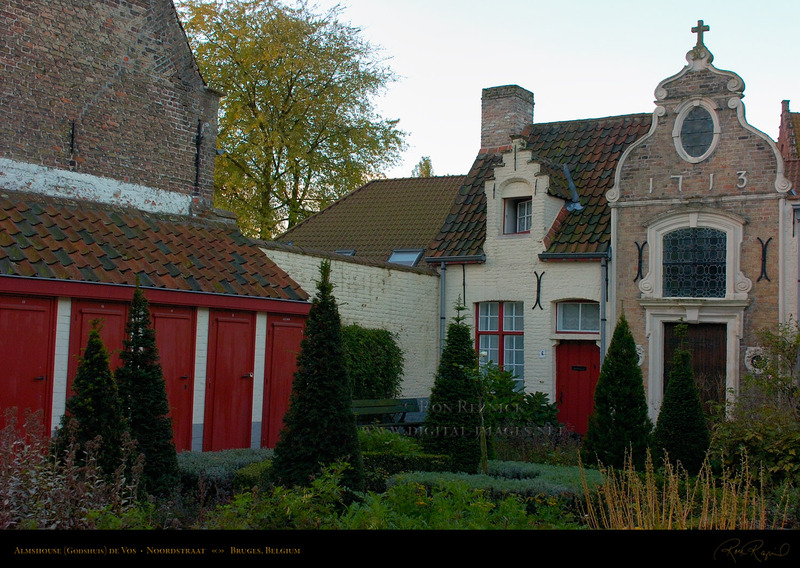 Many more images of canal houses are displayed on the Canals and Street Scenes page. 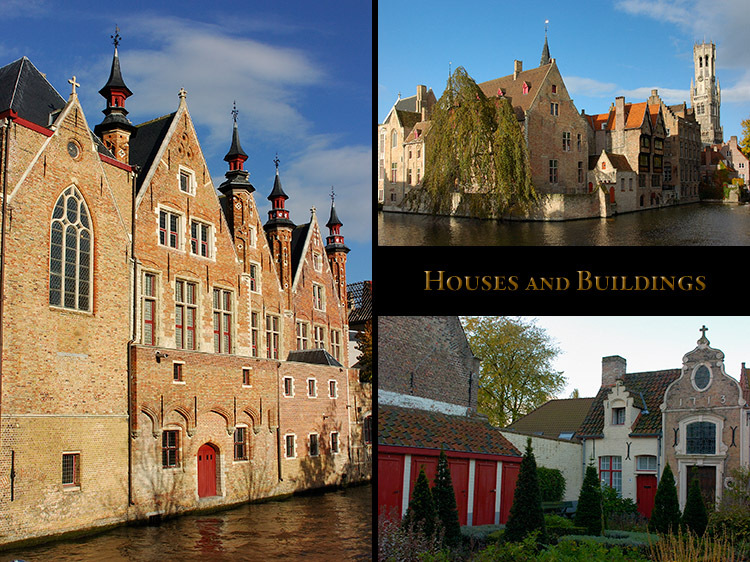 Following are images of some of the medieval buildings in Bruges. Peeking over the canal houses on the Groenerei (Green Canal) is the medieval Belfort (Bell Tower). 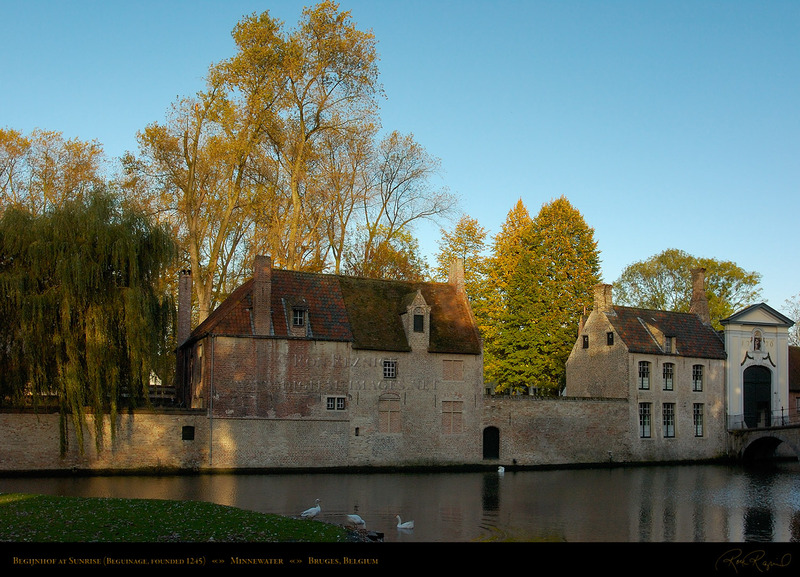 (Country House of the Liberty of Bruges, or Mansion of Bruges). 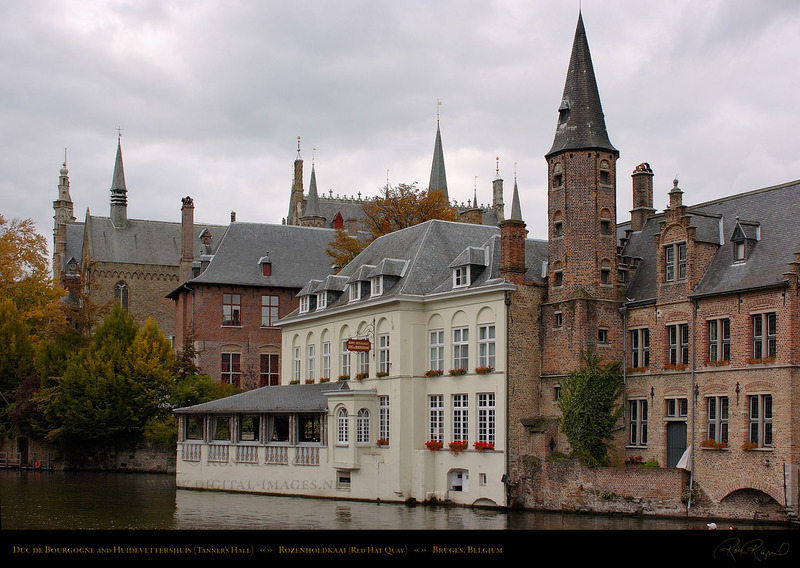 in the image above was configured in 1528-32 and rebuilt in 1728.
until in 1795, French rule put an end to the feudal organization of Flanders. Medieval Towers of Central Bruges. 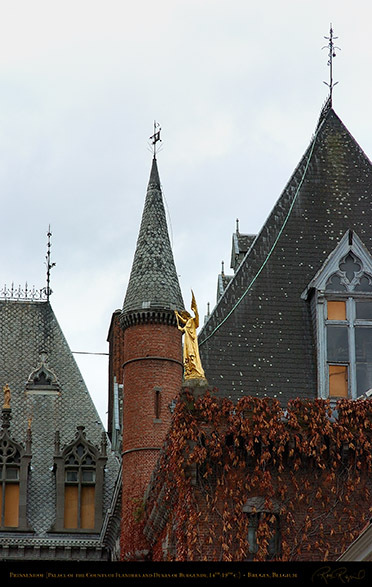 Far right: the medieval Belfort (Bell Tower or Belfry, 1240). 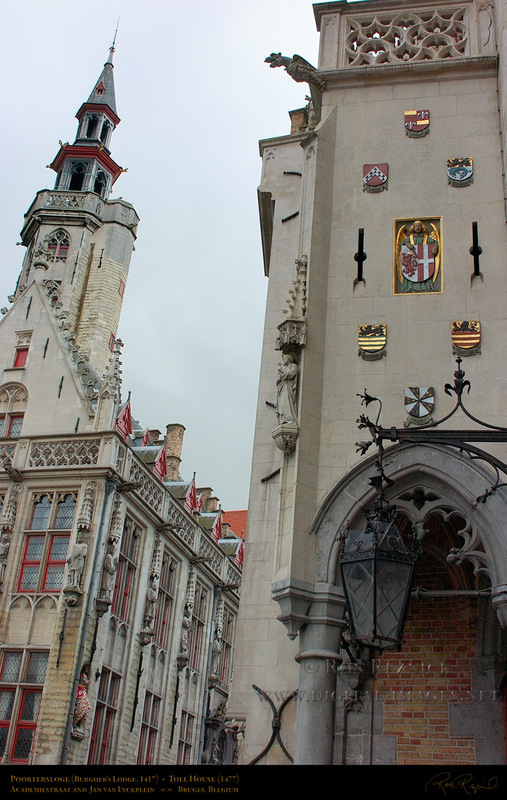 Medieval Towers of Town Hall and Burg Square. 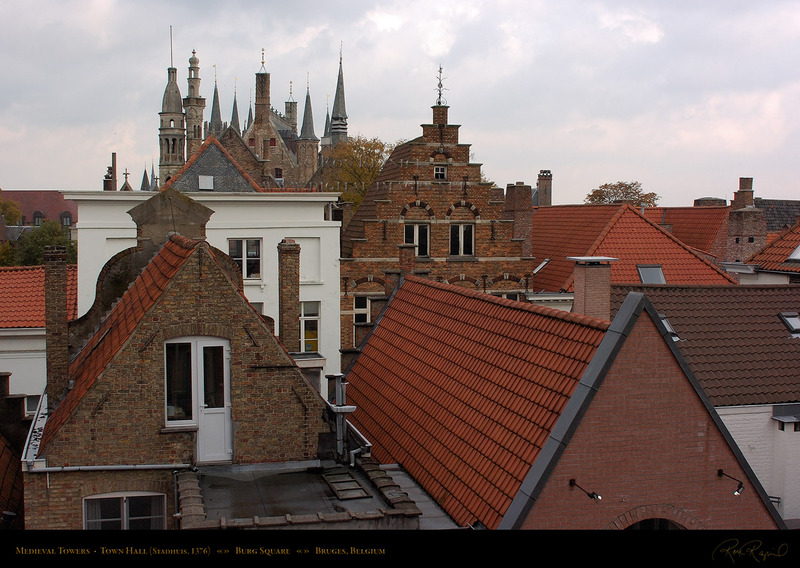 Rooftops of Bruges and Medieval Towers of Burg Square. Medieval skyline at first light: the Stadhuis (Town Hall) and Burg Square Towers. Rozenhoedkaai (Rose Hat Quay) on the Dijver Canal. On the opposite side of the Rozenhoedkaai are the medieval towers of the Stadhuis (Town Hall) and Burg Square, the hotel Duc de Bourgogne (center) and the Huidenvettershuis (right). was restored in the 17th century. It is now a restaurant. 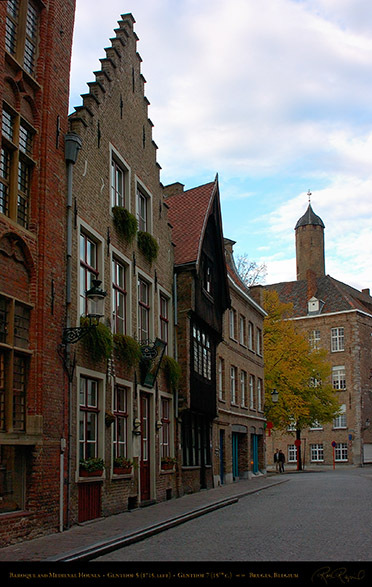 The Guild House stands on the semi-enclosed Tanner’s Square (the Huidenvettersplein), which from 1302 was used exclusively as the meeting place for the Tanners. 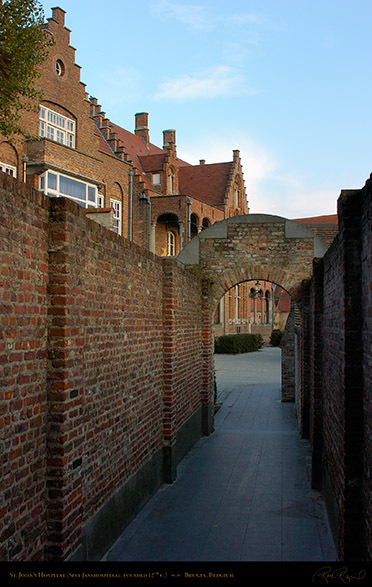 In those early days the Tanner’s Guild was so powerful, they had the square enclosed by gates at both ends, but by the 15th c. the civil authorities had the gates removed to reduce the power of the Guild. Due to the bad smell, the Tanner’s operations were eventually moved out of the square, which was then used as a small fish market, selling the cheaper fish as an adjunct to the larger Vismarkt on the nearby Groenerei canal. 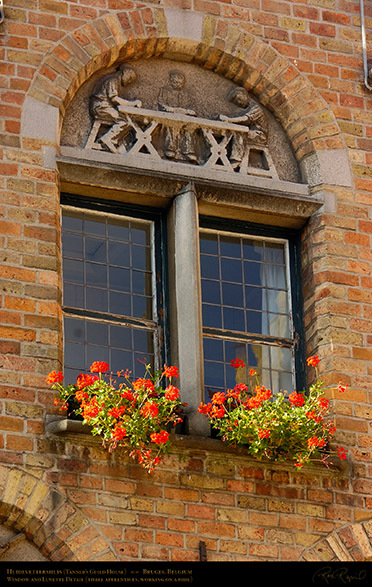 Huidenvettershuis gable window and lunette (detail right). Detail of the Huidenvettershuis from Tanner’s Square. The lunettes over the windows show scenes of Tanners working the hides. The upper story lunette (detail at left and below) and the relief over the doorway show apprentices at work. 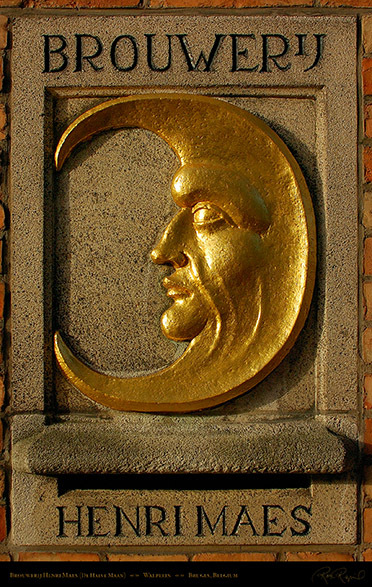 Detail of the relief over the doorway is further below. 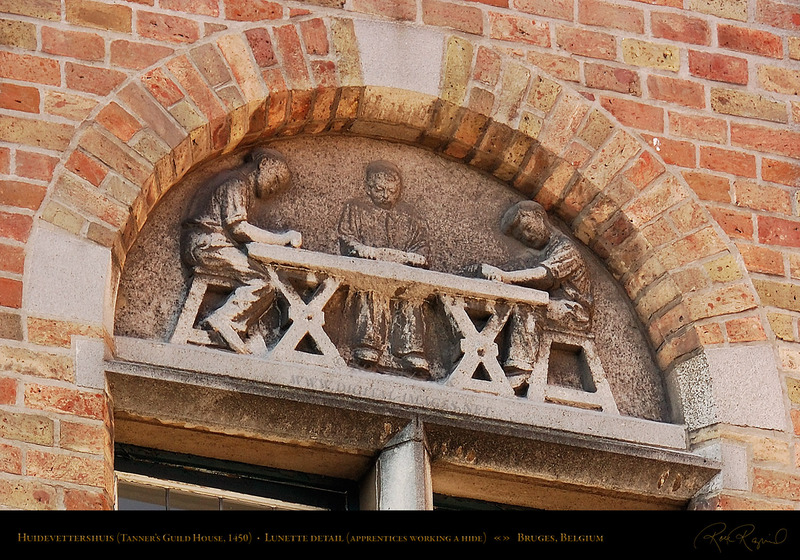 Apprentices scraping the Hides (detail of the lunette over the gable window on the Huidenvettersplein (Tanner’s Square) side of the Guild House (see the image at left for context). By the mid-20th century, the fish market stalls disappeared and the square became filled with souvenir stalls, chocolate shops and other vendors catering to the large number of tourists spilling onto the square from the nearby Burg Square. Detail of the wall relief over the doorway of the Huidenvettershuis. 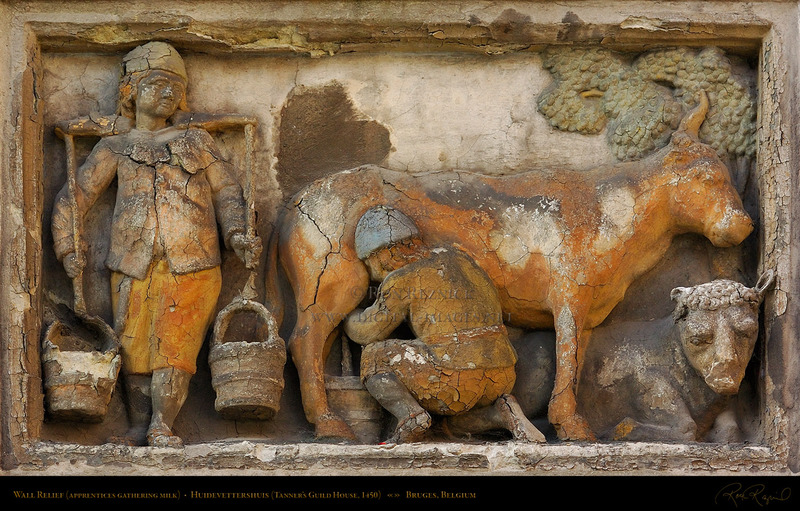 The pastoral scene shows Tanner’s apprentices gathering milk. Dijver (Groenerei, Green Canal) at the Rozenhoedkaai (Rose Hat Quay, terminal for the tourist boats). 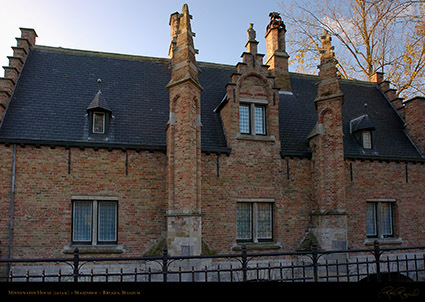 Huis Perez de Malvenda once belonged to the humanist Juan Perez de Malvenda. The Late Gothic house was built at the end of the 15th c. and modified extensively by Malvenda in the 16th century. Juan Perez de Malvenda (1511-1605) was instrumental in protecting the relic of the Holy Blood, brought to Bruges by Thierry of Alsace and stored in the Basilica of the Holy Blood. 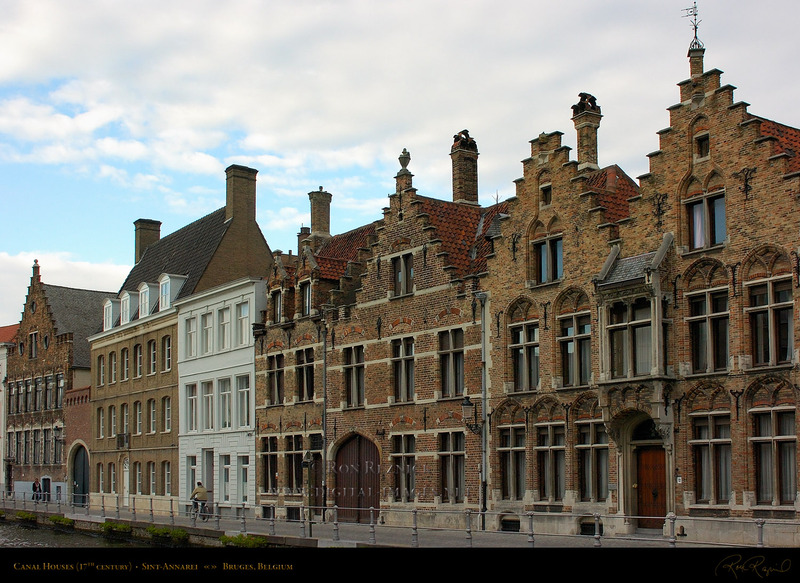 During the Calvinist turmoil of Sept. 1578, iconoclasts from Ghent invaded Bruges and sacked every church and chapel in the city. The City Council decided to gather all of the ecclesiastical treasures and store them in the Stadhuis (Town Hall). 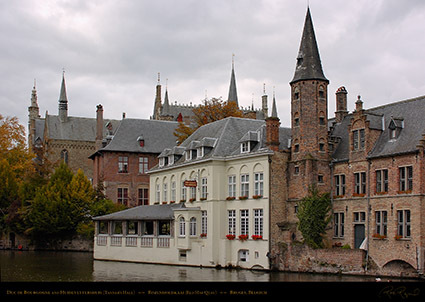 The Brotherhood of the Holy Blood gave the relic to Guild member Perez de Malvenda, who placed it in a lead coffin and buried that in a wooden coffin in his garden for six years, until in November 1584 the city came under control of the Spanish Authorities again, and Perez de Malvenda gave the relic to the Bishop of Bruges. 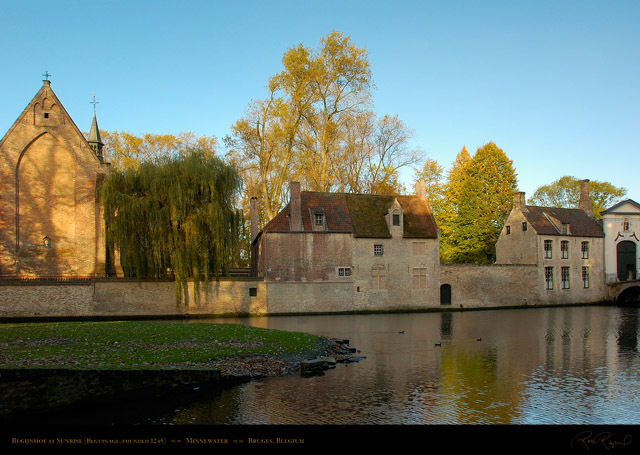 which was used as a reservoir to keep the level of the canals constant) is the Beguinage. Margaretha, Countess of Flanders (Margaret II), daughter of Baldwin I of Constantinople. 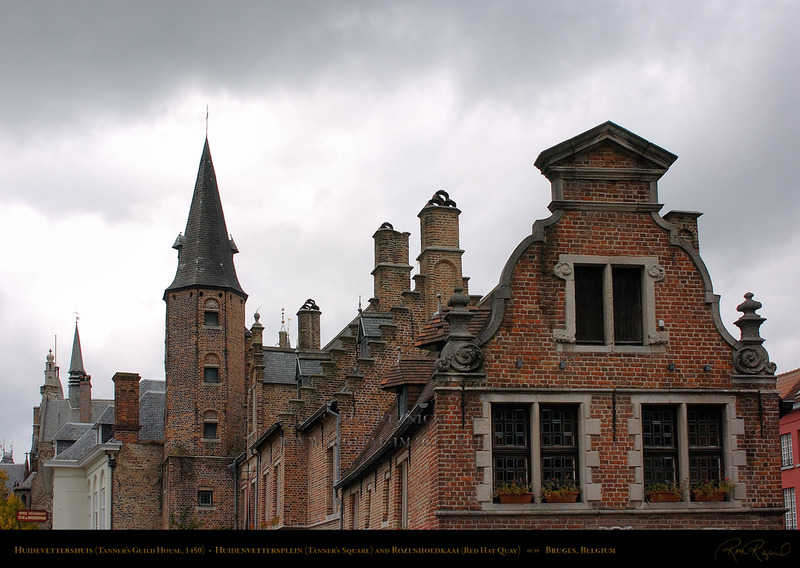 The Beguines were a lay monastic community in the Low Countries in the 12th-14th centuries. 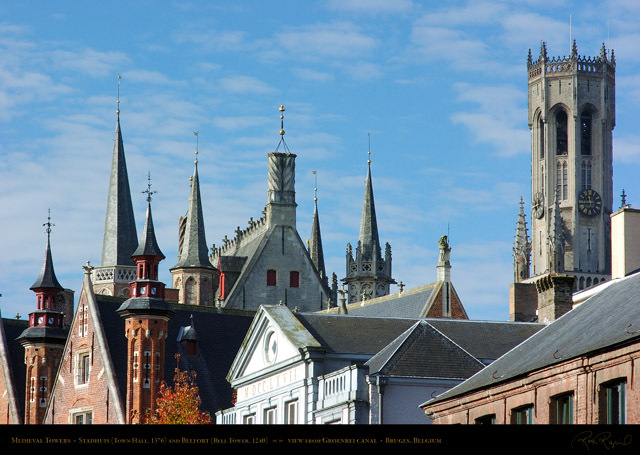 Beguines believed in a purer, more mystical religion than that espoused by the material and formal aspirations of regular clergy. They were distrusted and often persecuted by the church, but in the Netherlands and Belgium, the female followers of this movement were tolerated in the form of the ‘Beguine’ movement, and were allowed to live in separate areas (the Beguinages). This allowed the church to control them. The Beguines lived like normal nuns, but did not take the same vows (plus, they could leave when they wanted to). she refused to remove her book “The Mirror of Simple Souls” from circulation. 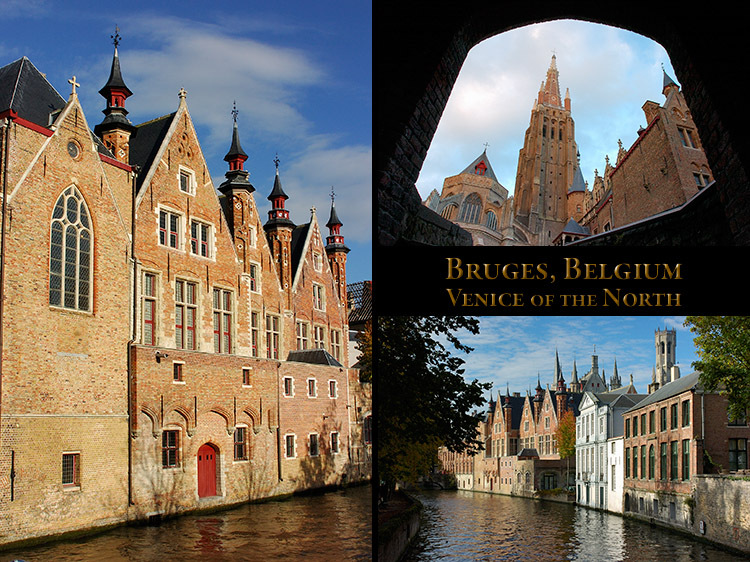 and are in northern Belgian cities such as Bruges, Ghent, Leuven, etc. Beguinage has been a Monastery of Benedictine sisters. The house at the north end of the Minnewater Lake on Begijnhof, straddling the canal, which flows under the house as seen in the image below. Superb Flemish Bond brickwork. 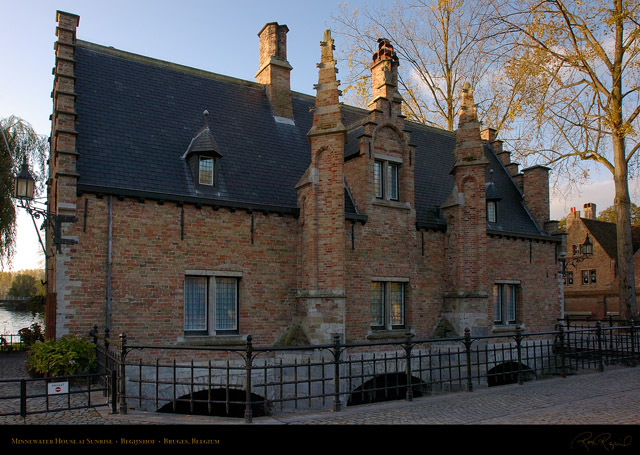 Poortgebouw aan Sasbrug (Gatehouse to Sasbrug) at the junction of Begijnhof and Begijnvest. 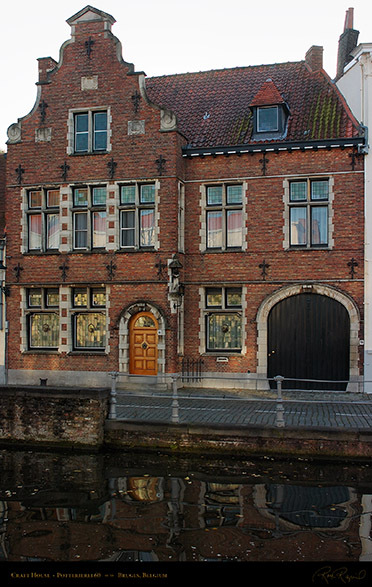 breedhuis (broad house). 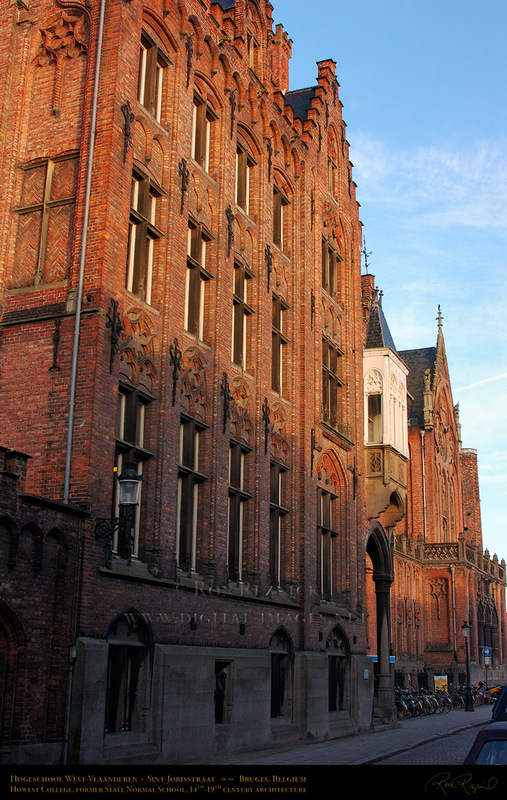 The exquisite brickwork reflects the early morning light. on Groeninge. 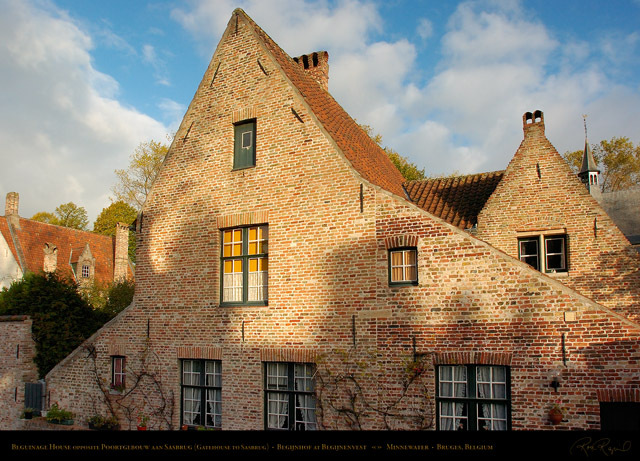 The 17th century breedhuizen (broad houses) were restored in the early 20th century. from the Fleming Bridge. Restored in 1877 and 1974. 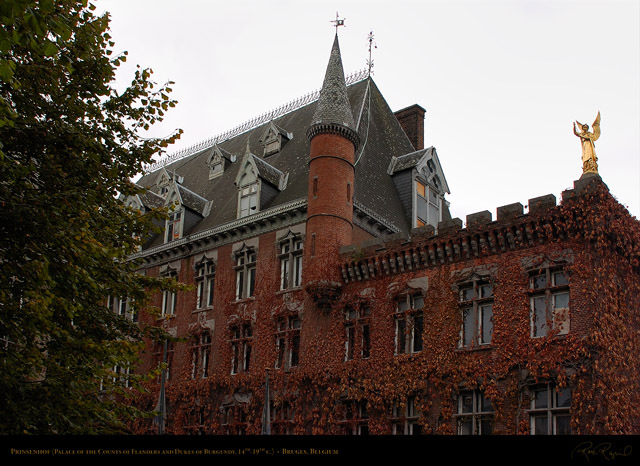 The Prinsenhof, former Palace of the Counts of Flanders and the Dukes of Burgundy. 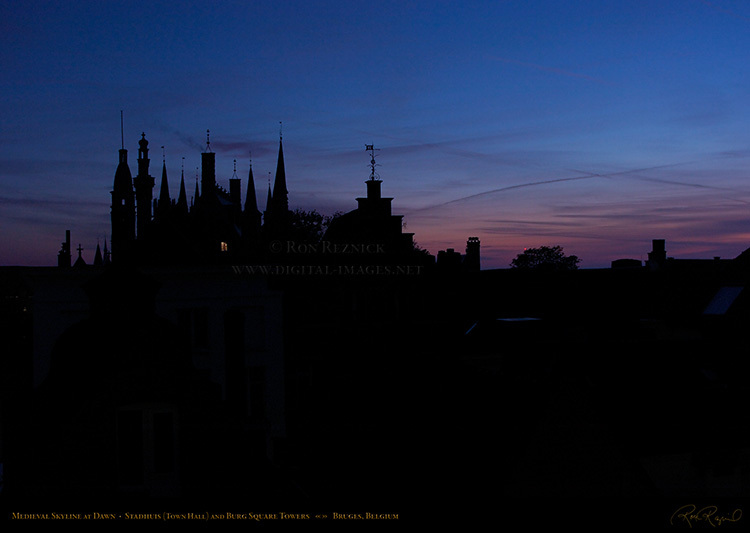 This image was taken during the restoration and conversion to the Kempinski Duke’s Palace Hotel. It was originally built in the 14th century, with later wings. The 14th c. Prinsenhof, former Palace of the Counts of Flanders and the Dukes of Burgundy. In the restoration the ivy was stripped, the brick was cleaned, and a new structure was added behind. 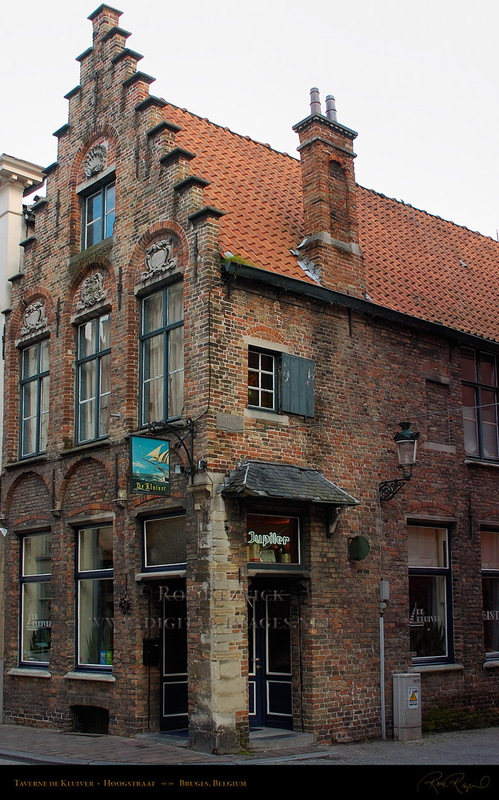 Old Toll House (1477), where taxes were levied on goods. 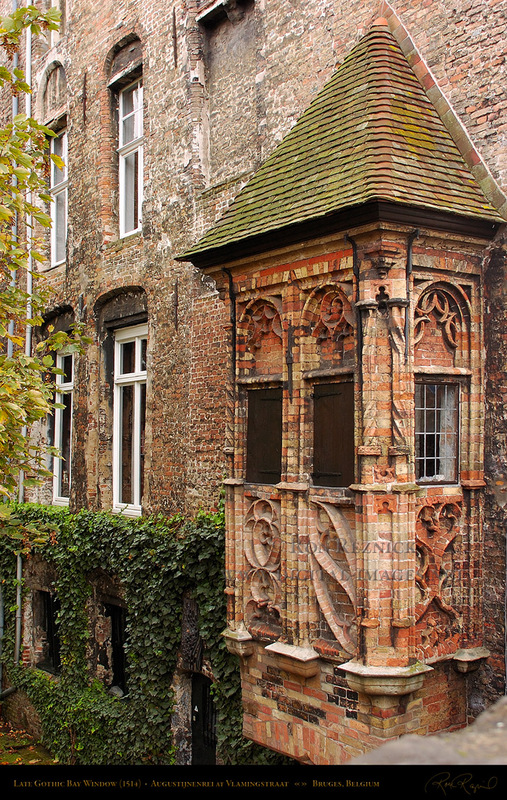 Both are located on Jan van Eyckplein in central Bruges. Sint-Annakerk Tower was built in 1516. The Baroque church was rebuilt from 1580 (the Sacristy was not demolished, and the tower was rebuilt). 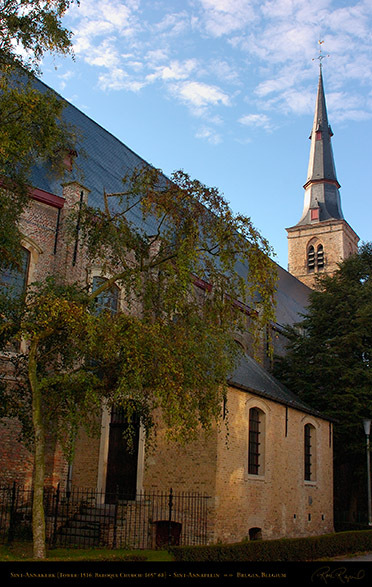 The current spire was placed in 1761. 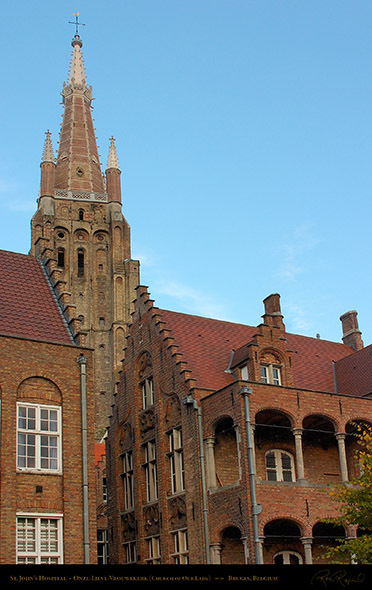 The medieval Sint-Janshospitaal (St. John’s Hospital), one of the oldest hospitals in Europe, with the 122 m. brick tower of Onze-Lieve-Vrouwekerk (Church of Our Lady) rising above it. 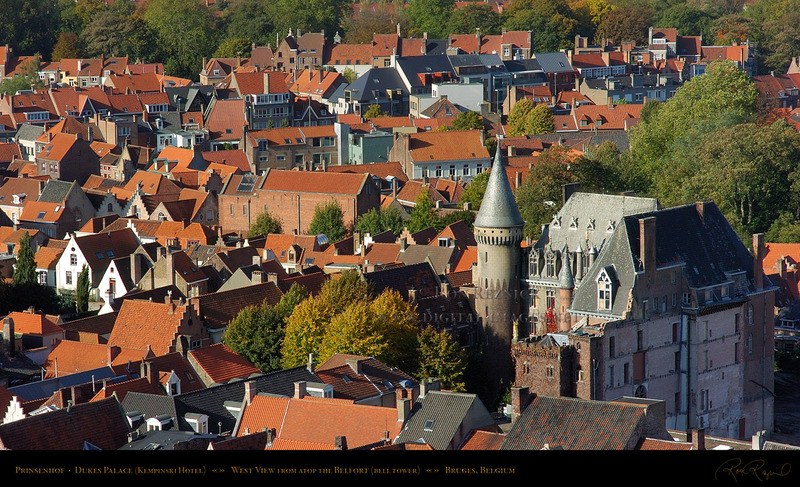 The earliest documentation from Sint-Jans is dated 1188. The lay order of brothers and sisters did not belong to a religious organization until 1459 (to reduce the power of the Duke). In 1600, the hospital, which cared for pilgrims, travellers and the ill, became an all-female institution. 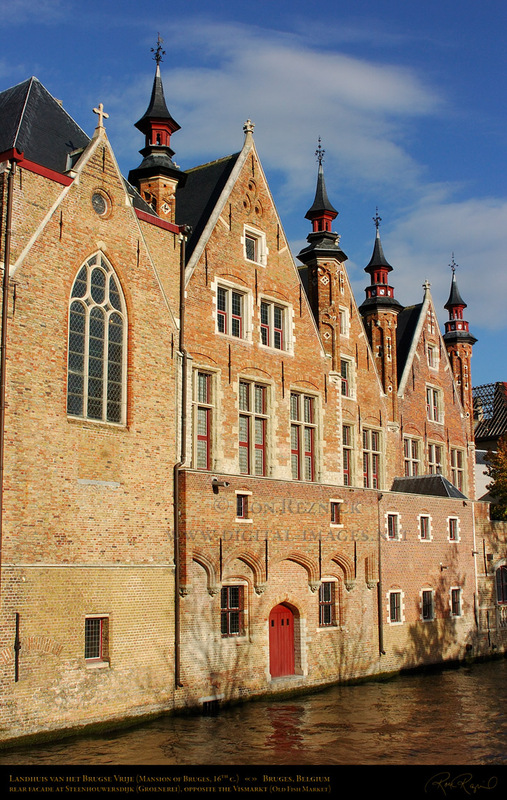 It continued functioning as a working hospital for 8 centuries (until the 1970s), when it became a congress and meeting center (the chapel was converted into the Hans Memling Museum). 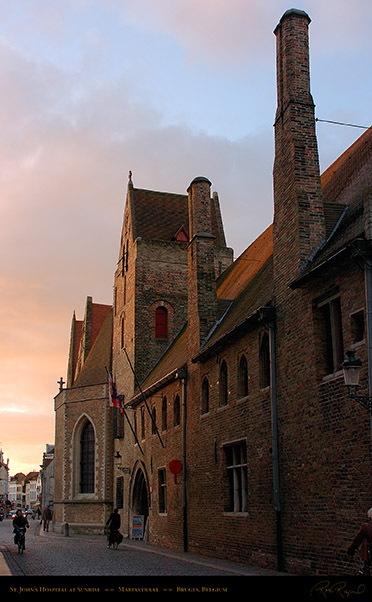 Sint-Janshospitaal at sunrise. This is the oldest part of the St. John’s Hospital, directly across from Onze-Lieve-Vrouwekerk on Mariastraat. Built in the 12th c. just inside the Mariapoort in the first city gates, the Romanesque tower was built in 1234. Cathedral Sint-Salvator Tower rising above Neo-Classical buildings on Zuidzandstraat. 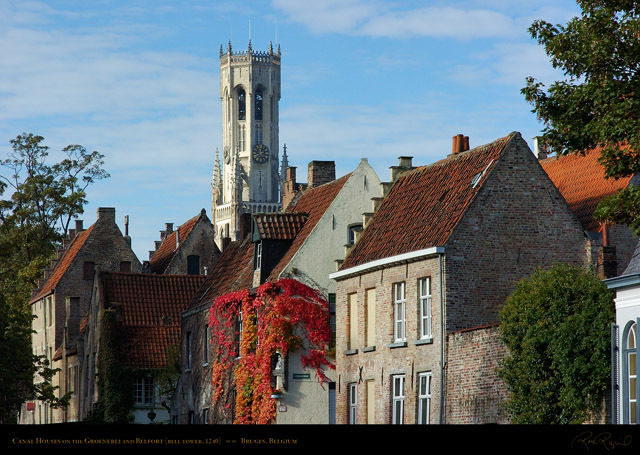 tower was destroyed by fire in 1358, and a belfry was rebuilt above the foundation in wood (1635). direction of the Bruges architect P. Buyck based on designs by English architect R. Chantrell. 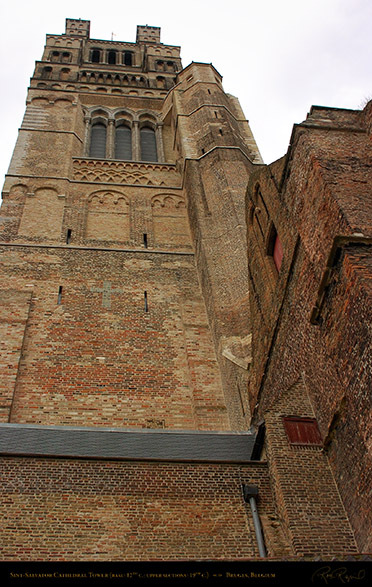 Sint-Salvator Cathedral Tower from the south. 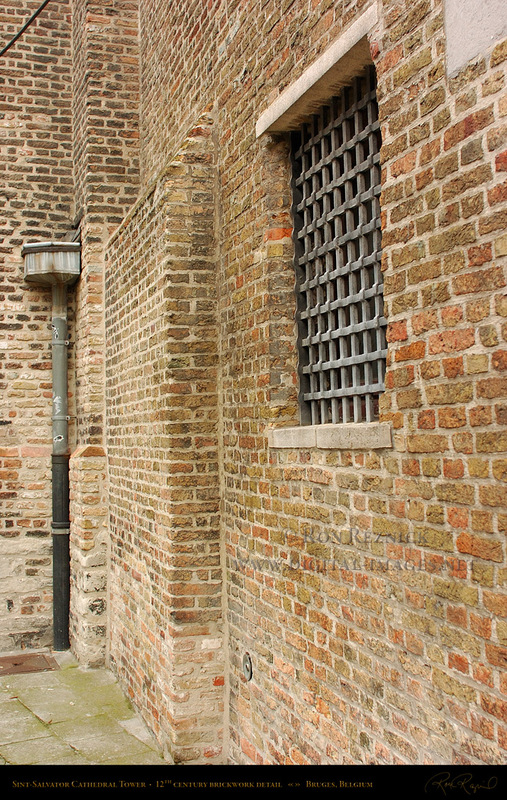 12th century brickwork at the base of the tower. 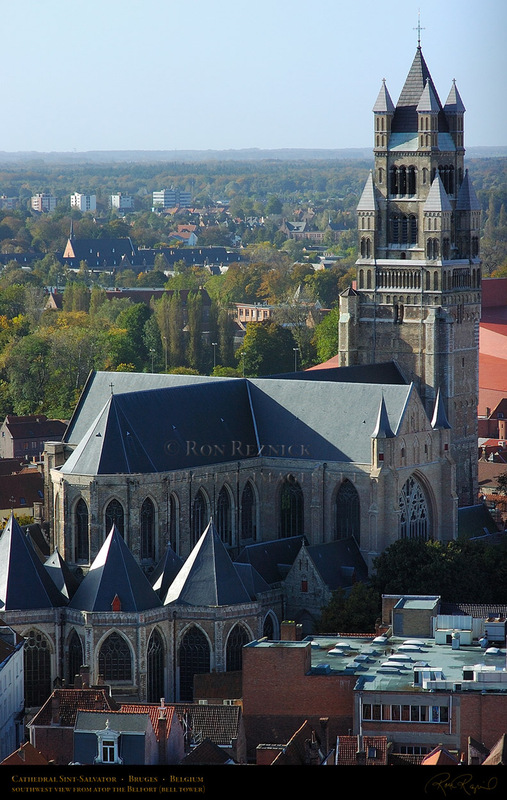 of the tower was built after the 1839 fire, when English architect R. Chantrell restored the cathedral. 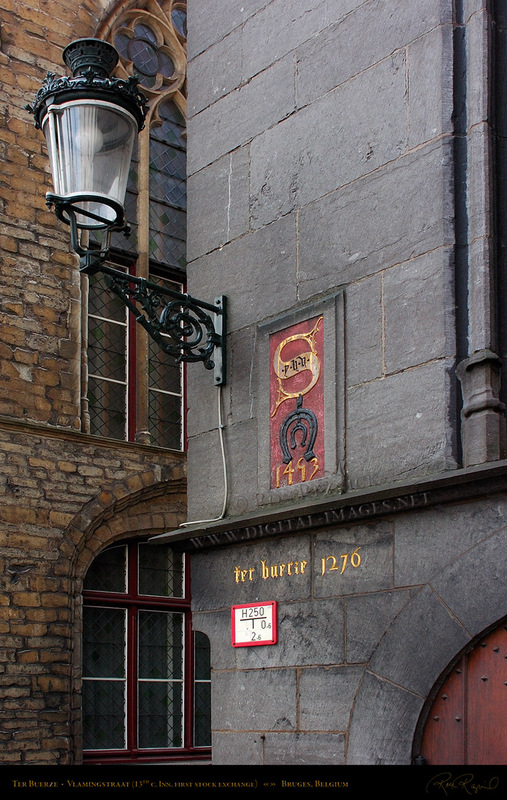 Number 17 Spiegelrei (left) is a 17th century diephuis (deep house) with a 19th century Neo-Baroque facade. No. 18 (right, originally two houses) uses sandstone in a similar manner to that of No. 17, but adds elaborate tracery in the tympana over the upper story windows and an ornate Baroque doorway. 17th century tavern at the corner of Hoogstraat and Meestraat near Burg Square, originally the guild house of the Goldsmiths (De Gouden Kroes). 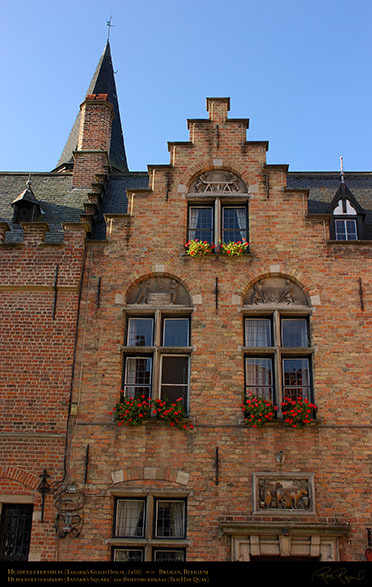 The tympanum (lunette over the window) in the gable has a shell device, the tympana over the windows on the second story have ornate shield devices. 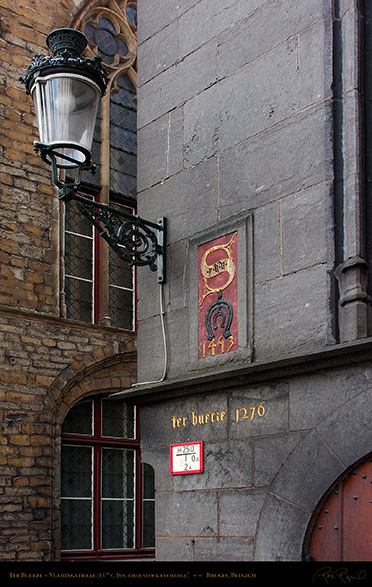 An unusual juxtaposition of a tavern next to a firearms shop in two 17th century diephuizen (deep houses). Huis ter Beurze, an inn where Italian merchants traded in the 13th-15th centuries, becoming the first stock exchange, or bourse, run by five generations of the Van der Beurse family. In the late Middle Ages, transportation costs rose and the Champagne annual fairs had ceased to exist. 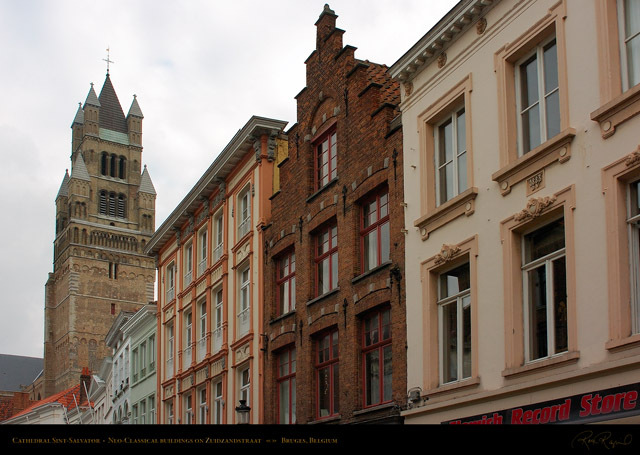 stock exchanges in many countries (beurs or bourse) and the name of the square (Beursplein). is so well known. 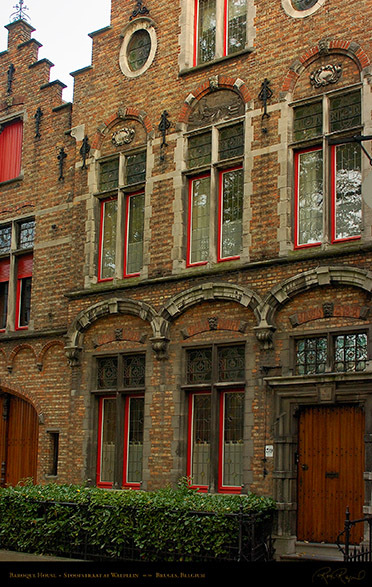 Bruges lace is a filigree technique made up of ribbons united by chains. 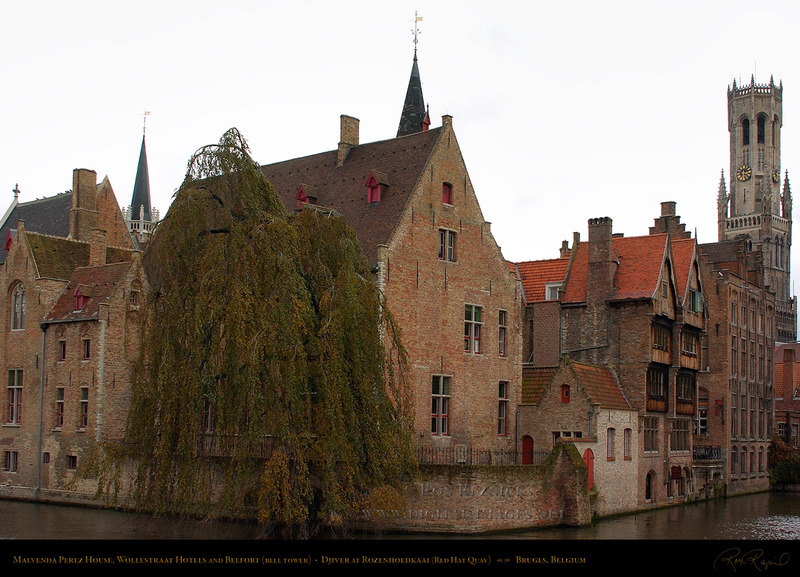 Bruges was the most important linen, wool and lace outlet in Flanders in the Middle Ages. the Bruges lace and cloth industries essentially saved the city from financial ruin. The former State Normal School, Howest (Hogeschool West Vlaanderen) was the Old Guildhall of the Archers of St. George from 1321. 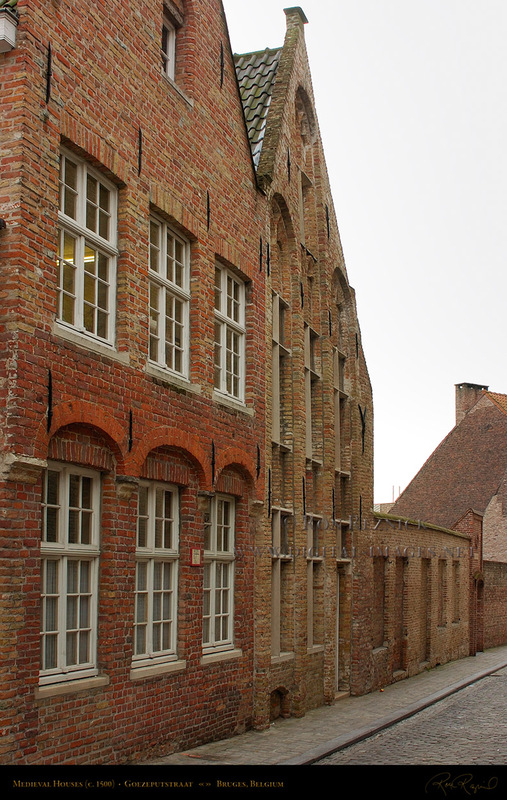 The building contains 14th c. architecture. The building was expanded significantly in the middle of the 16th century with addition of a large house, a chapel and the stair tower. 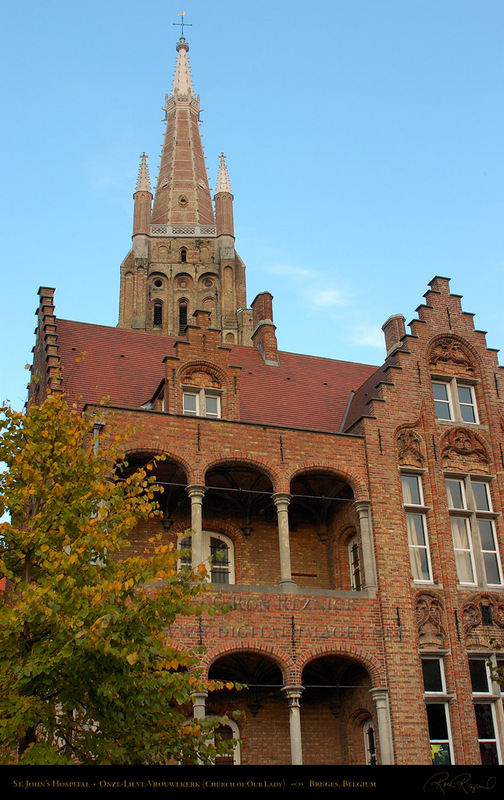 In the 19th c. it was converted to the State school. 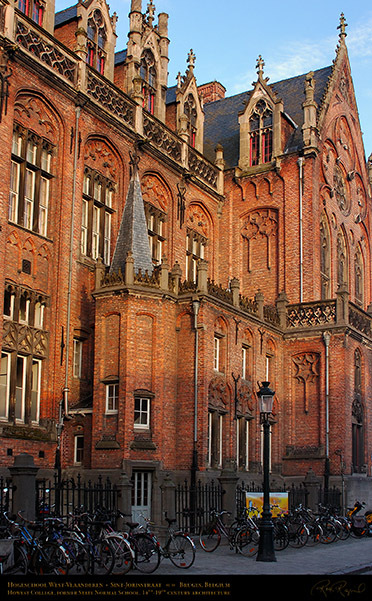 facade as shown above is that of a castle, including an octagonal stair tower under a slate spire.